Provoked and Propelled to Praise • Run Hard. Rest Well. Two quick questions for today. What provokes and propels you to praise God each week? Sunday worship? Good news? A great song? A beautiful sunset? All things? Think through yesterday and today. How many times did you pause and praise? Count them up. What’s the tally? Did you come up with a goose egg, a zero? You are not alone. Praise is a “pause with a cause” worth pursuing. Surprises await those who invest and engage. Praise sets an ambush. 2 Chronicles 20:22 spells it out. As they began to sing and praise, the Lord set ambushes against the men . . . who were invading Judah and they were defeated. 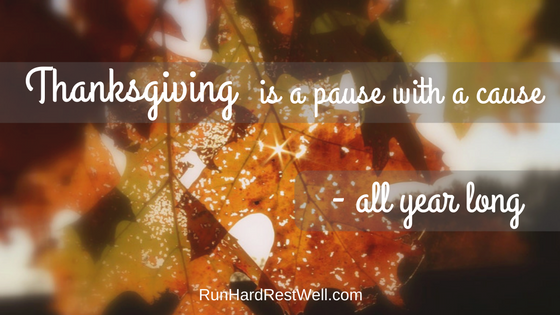 Thanksgiving is a pause with a cause, but a meager way to live, if our gratitude is confined to a single day. Daniel prayed 3 times each day. I imagine he praised God 3 times each day as well. Let’s do a Daniel. What’s a good trigger for you? Meal times? Phone alarms? Anger, anxiety, time outside? What could prompt and provoke you to make praise a “pause with a cause” each day, at all times, through thick and thin? Psalm 103:1-2 is a good place to begin. May the true blessings of Thanksgiving be yours now and always. Beautiful, Brenda! Thanks for the reminder!! Kim, God is so good! So faithful! He knows how hard we run each day and He knows we need reminders. So He meets us in surprise places and opens our eyes so we can sing again. So good, Brenda. I know I don’t praise often enough. But praising by rote, isn’t a good either. There is a happy medium. For me, I think it comes with lots of practice. Then it can spill over into praise and thanksgiving to friends and family. Praise does that. It has a way of spilling out, over and into the lives of those around us.